Turn back the hours, make it yesterday. What would I give to start with you again, beloved friend? Share wine and bread and share the laughter, too. This time, believe you really are....The Way. I’ve betrayed you.....with a kiss. Too late to change things.....I suppose. Good Friday is coming up in just a few days. Having wondered many times if Judas regretted betraying Jesus, I wrote these lyrics as part of “Hands!” The Musical and my co-writer, David Wheatley, wrote beautiful music for it. He has sung and played it several times for Good Friday services and it is very moving. We don’t really know, do we, what happened with Judas, except that it all went wrong. Maundy Thursday services are coming up, commemorating Jesus’ breaking of the bread, “This is my body given for you. Do this in remembrance of me. And taking the cup he shared it with his disciples and said, “This cup is the new covenant in my blood; do this, whenever you drink it, in remembrance of me.” We’ll remember, too, that Jesus washed his disciples feet, Peter protesting all the way. The Good Friday service will end in silence and darkness, but we know Sunday is coming! He is risen! He is risen, indeed! We know our Redeemer liveth! Easter at last! A time of celebration that has absolutely nothing to do with bunnies (chocolate or otherwise), exhaustive hunts for hard-boiled eggs or even honey-baked ham. It might have something to do with new outfits, but extensive biblical research has not proven that, one way or the other. "Before Dawn…Sunday" celebrates the fact that Jesus did, indeed, rise from the dead and lives today. Which is an exciting thought, an amazing concept upon which we base our lives. And beats the heck out of chocolate bunnies and Easter eggs….unless they were dyed personally by your favorite four year old. Who, would roll away the stone. What did it matter, anyway? Who changed her life, was gone. Streaks of pink and gold. The stone was rolled away! Like the stone, was rolled away! To tend her Lord, early on that Sunday. He’s risen, as he said! He is not here, he’s risen! 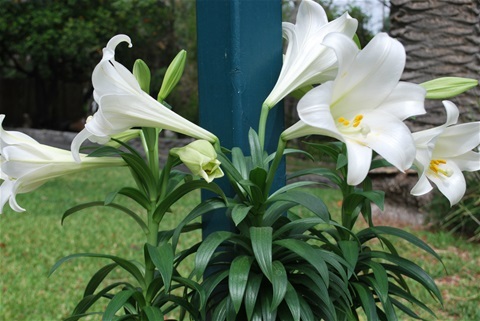 We rejoice on Easter as we KNOW that Our Redeemer liveth!